FRIDAY'S POST ~ Friday, day of artists and poets. Illusive muse managed a walk in between rain showers today. Creative spirit restored momentarily. In a previous life, I must have risen from the ocean, my spirit thirsts for daily walks by the ocean. Do you have a favorite place to renew your creative energy? Hope you enjoyed your visit viewing a piece of art work and reading some haiku over a gentle cup of tea. For more delightful creations visit the links listed above. Wishing you a peaceful and healing weekend. Wow! These are lovely. I like the second one the most, but they are all wonderfully composed. What a wonderful 'work in progress'. Hi Carol, thanks for your visit yesterday. Your art quenn is lovely and so is your poem. Your talen in the field of art is lovely. oh yes! That is Mary, she is our Mother! Catholics believe she intercedes for us. love your little angel and your fall haiku! Hey, Carol, you made a lovely set of haiku! They link up perfectly with the falling leaves season. I like the color you've chosen for the Queen of the Universe. She is beautiful! Your haikus are excellent and always very thought provoking. Fab little angle too. lovely spiritual piece today, love the blue. More great words on the changing season. Nicely done. Such a peaceful aura around her, Carol. I love the blue. Hi Carol. Love your Universal Queen and her colors. Enjoyed your Haiku's. Have a wonderful weekend. ah, such a sweet piece! Your universal queen is so lovely and demure...and the words just speak volumes for this time of year. So lovely Carol, this painting and your haiku... She is the night sky over your beautiful words... my favorite line is "cocooning into night season..." Have a beautiful weekend! Very nice work. I just returned from a wonderful hike in the nearby woods with my dear friend and feel wonderfully rejuvenated and relaxed. We need to stay connected to nature in our hectic lives! 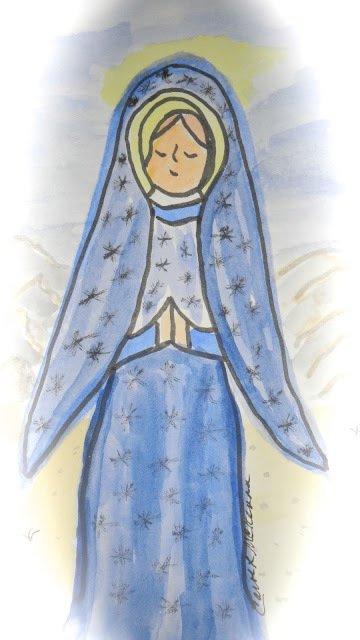 The Queen of the Universe reminds me of how Mary, mother of Jesus has been portrayed in art through the ages, which is probably not just a coincidence as she embodies many beautiful qualities as I'm sure the queen of the universe also does. your universal queen is lovely-she'd make a beautiful Christmas card! Anytime I'm outside in nature-especially by the ocean I am most inspired. Wonderful haikus. Happy PPF! She's beautiful! I used to live on the coast and, oooooh, did I love the ocean and the smells. There's just no place like it. What a beautiful queen, beautiful haiku also, they spoke to me. Great painting! Very sweet and peaceful! HPPF! Congratulations on finishing your sketchbook, too! I love the changing seasons,and I can tell by your words that you do too! Beautiful Goddess Queen! I get outdoors to to revive my creative spirit and it that doesn't work I put on my grandmothers sweater ( she passed 36 years ago) , grab a cup of hot tea and meditate. SHe was the first Creative Spirit I knew and she taught me so much about life. There is something magical above the move from summer to autumn...and you capture the magic in your words. Hi Carol, i loved your beautiful fall Haiku--so beautifully strung together. Love your beautiful Fall Haiku! If i was near the ocean that would be where i would go but since i am not.... It is the river for me.... Any where there's water! That quote made me giggle! Love it. Pretty painting and wonderful seasonal haiku of the cycle of a tree. I especially like that last set. Being seasoned is good! Have a great weekend! Such a peace giving little spirit you have created. She is lovely. ArtMuse Dog is so adorable! I love how you took us through all the seasons in your haikus this week! I love your Madonna 0 thats what she looks like to me considering my background - but she was just the representation of the archetypal feminine anyway --- Friday is the day of Venus - how right to say the day of artists and poets! I generally just go for a walk down the street in front of my house - it ends in a valley with a pasture with horses and that's the best thing ever - ahve a great weekend thx for stopping by!! I love the ocean too, and wish I lived closer to it. Any water does me well; luckily we live by many lakes, streams, and waterfalls. Beautiful queen and lovely haikus! Lovely words and universal queen to go with it. I firmly believe that the ocean can be healing, as well as all of nature really. I'm so glad I stopped by... I love the haiku, and reminds me how liberating it can be to do a haiku-a-day... and think in haiku :) -- And the sweet Art Muse Do of yours has captured my heart! My 1st encounter w/that breed of dog was just last year, w/a friend..(the dog's name is Violet) -- and she has such a big presence..and its so healing to be around her... I feel the same way when I look at your dog... so thank you so much for sharing her, and your wondrous creativity! Lovely Universal Queen and I always love your haikus, they are so beautiful and true. "cocooning" is such a mellifluous word! i'm with you-- the ocean has a strong draw for me-- providing both peace and energy. your painting is so soft and peaceful. and congratulations on getting your sketchbook finished! Beautiful universal queen - she looks very calm. The ocean gives me a lot of inspiration as well. It's a place I just love to be. Wonderful haiku. Love the phrase "the night season"
She is ever so saintly! Love her sweet expression! I too love the ocean. That's the sweetest Madonna image I've seen in a while. Blessings to you and art muse dog. always i find beauty and a loving heart when i visit you here by the enchanting sea. Love the 'starry angel/madonna' figure! Great work! So simple and beautiful, Carol. Your words and art alwys bring me a smile and make me think. I too love the ocean and feel that I must have once lived there, either IN or beside the waters, but rain seems to be waht fills my well of creativity. When I see a gray sky and thunderclouds, I immediately feel a rush of inspiration and want to dash up the stairs to my studio and spend a cozy day painting. My absolute fantasy would be to have a tin roof, to make the sound of raindrops even louder! wonderful work Carol! Love her serene expression and the colors. I usually take a walk outside our garden to renew my creativity or sometimes a rest. Hope you have a nice day!